Join a gay group trip and explore Sri Lanka. Having been part of the Portuguese, Dutch and British empires, you’ll find many different cultural and architectural influences. You’ll also explore Sri Lanka’s monasteries and the ancient city of Anuradhapura, the capital of 113 different kings. From the royal gardens of Sigiriya Fortress to the ancient monastery of Ritigala, you’ll see the cultural riches of this fascinating country. When you arrive at the airport you’ll be transferred to Negombo, a small village that was the hub of the cinnamon trade for the Dutch empire. You can cruise the waves on a kiteboard, try the seafood and take the heritage walk through the bustling streets. In the evening, we’ll have a classic Sri Lankan meal on the beach. Anuradhapura was the major city of Sri Lanka in antiquity. It contains many well-preserved ruins showcasing the countries’ distant past: 113 kings reigned over this city over a 1300 year period. At Sri Maha Bodhi we’ll see the world’s oldest tree. According to legend, this is where the Buddha attained enlightenment. We’ll also see Ruwanweliseyam, founded in 140 BC, and explore its many sacred relics. Ritigala is a Buddhist monastery founded in the 1st century BC. Known as the Forest Monastery, the mountainous setting is great for trekking. In the evening we’ll visit Minneriya National Park where we’ll see herds of elephants rolling on the grass – they this is the largest elephant gathering in the world. Today’s adventure begins at Sigiriya Fortress, the citadel of King Kasyapa. Guarded by “Lion Paws” and opening onto the royal gardens where you’ll find a “Mirror Wall” of ancient graffiti, the setting is truly spectacular. 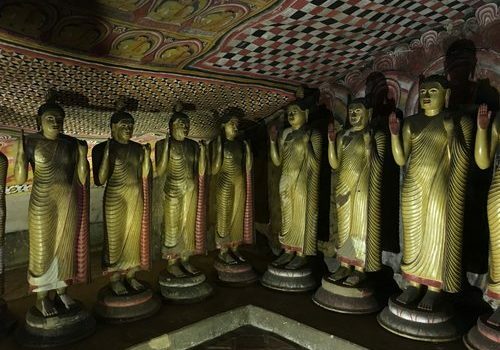 We’ll then explore the city of Polonnaruwa which is full of resting Buddha statues and striking stone carvings. In the morning we’ll explore the scenic village of Hiriwadunna. After a classic Sri Lankan lunch we’ll head to spice plantation in Matale. Then, we’ll move on to Kandy, the last capital of Sri Lanka’s kings. In the morning we’ll walk the Peradeniya Gardens, founded by King Wickramabahu III in 1371. In the 1940s, under British control, the gardens were the headquarters of the South East Asia Command. We’ll move on to Hatton which is surrounded by tea estates and waterfalls. Here we’ll learn about day to day life in a plantation community. Galle is the capital of the South. We’ll explore its distinctive Dutch architecture. On the “Old Gate” you’ll see the British Coat Of Arms. It’s flanked by an 18-foot lighthouse. Having endured the Portuguese, Dutch and British empires, Galle is a great melting pot of architecture and culture. Day at leisure in Galle. We’ll head to the capital city, Colombo. We’ll explore the old colonial centre, take a tuk-tuk to the ancient district of Pettah and visit the trendy boutiques. The bells of Gangarama temple will chime over our heads as incense wafts along the street. In the evening we’ll have a farewell dinner. You’ll be transferred to the airport for your return flight.